The crystal clear HEAVY DUTY 7” LCD Monitor is a perfect addition to any driver that needs assistance backing up. See the whole world behind you in rich colors. It is also an LCD monitor so it is very light as well as thin. In addition, it has two video inputs so you can connect a camera and a game system or DVD player. 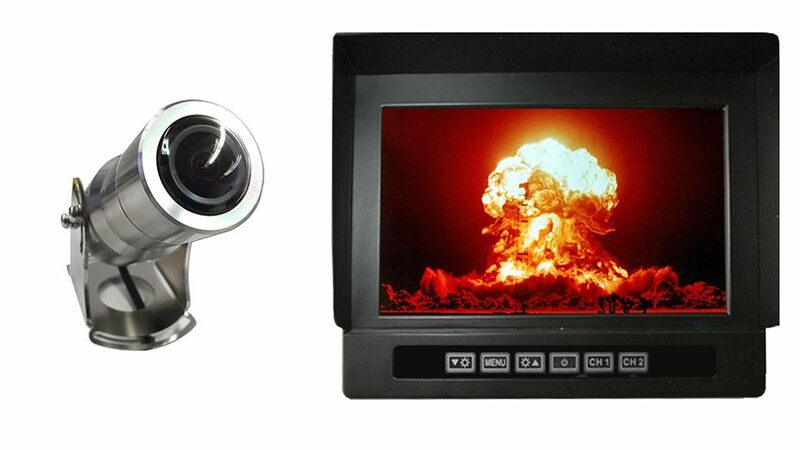 This monitor is compatible with all our cameras and any car; it connects to any power source or a cigarette lighter. It can mount on your windshield or dashboard (mount included). Super easy installation. The camera and monitor are THE MOST durable we have, with incredible adjustability and night vision clarity. The commercial heavy duty Backup camera has a metal housing that will protect it from just about anything. This is by far our toughest built backup camera you will ever find, it can be pounded hard and still operate without issue. The camera is wartime ready, its home is on a SWAT vehicle or an MPV. Like our other cameras, It can also be used in cars, vans, buses and even industrial sized caterpillar trucks, operated in the harsh oil sand of Canada. This backup camera can take a direct hit from a rock and it will still work like new. The camera has an IP rating of 69K and has a built in microphone as well for audio. In the case of an explosion this camera will not break apart or melt, it will stand strong in its housing. It has a stainless steel body. It also has an Anti-Salt, Anti-Germ Body. Perfect for mines, boats, underwater, factories etc. It also has a super wide angle for the largest viewable area possible.